*Tom Yum (Hot & Sour Soup) - Thai Noodle Etc. Small or Large. 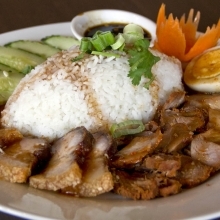 One of the most famous Thai dishes. Tom Yum is a subtle blend of hot and sour with citrus overtones, mushroom, lemongrass, galangal and tomatoes.